When I started the Vile Menagerie version 1.0 on the old Rock of the JLA fan site, The Marshal was one of (if not the) first entries I wrote. I was still pretty ignorant about the Martian Manhunter rogues gallery back then, and in the company of dudes like Professor Ivo and Asmodel, the Marshal was one of the only legitimate entries (ignoring only the most liberal parameters for inclusion.) Then again, it's not like anyone else was breaking a sweat putting together a better list in 1999 or whenever. Anyway, the Marshal was a proper Alien Atlas adversary, and figured into one of his all time best covers, but I can't honestly say he made much of an impression. "War of the Worlds 1984" was an impactful story because it was used to justify the disbanding of the Satellite Era Justice League of America and their being replaced by the infamous Detroit-based operation (which some would say was more like an impaction.) The tale also returned J'onn J'onzz to the League, to regular appearances in comics in general, and set the stage for his full embrace by fandom as a Super Powers figure and key member of the beloved JLI. On the other hand, the "WotW 1984" story itself never rated much attention, and was clearly a rushed, illogical affair manned by a couple of warm bodied fill-in artists. None of the featured players ever appeared anywhere again (including the sensational character find of 1972, Bel Juz*) and the event was retconned out of existence by Crisis on Infinite Earths. The Marshal and the Challenger ahead of him were also taken out with expedience unbecoming a super-villain likely to get work in future comics. The Marshal doesn't even have a distinctive, Google-friendly moniker. What a wash-out! 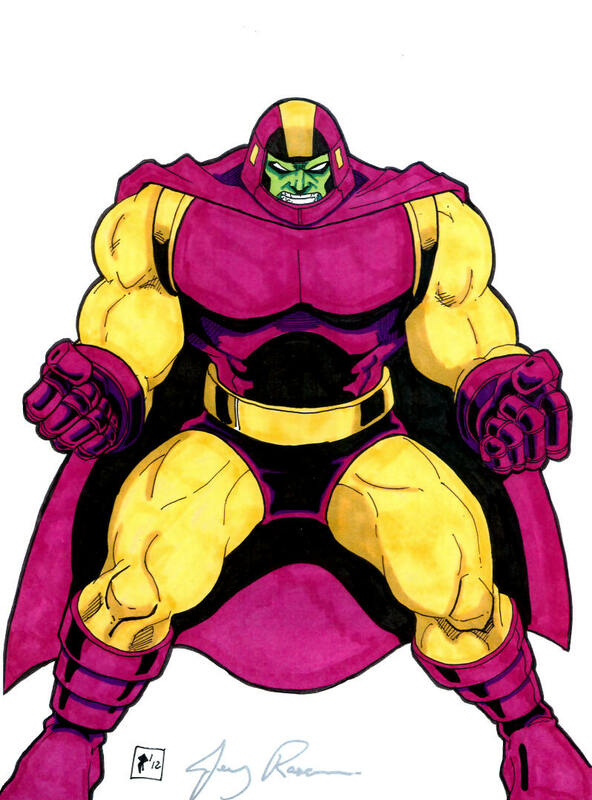 Despite not being especially enamored with an over-hyped glass-jawed cheat, I see potential in the big lug, and "WotW 1984" was the capstone on the Martian Manhunter's Bronze Age. Ostrander and Mandrake's Martian Manhunter series exclusively employed newly created villains, of whom only Ma'alefa'ak is widely remembered. Another series attempt would be wiser to mine the archives, and guys like the Marshal and Commander Blanx are more functional and familiar to mainstream readers than obscure oddities like Mister V or Professor Arnold Hugo. Keeping this in mind, the Marshal was in the initial stack of reference I put together for my first trip to Comicpalooza. The last artist I spoke to at the convention that year was given their choice of several options, and picked Bel Juz & Commander Blanx for a proposed two-figure piece. I pointed out that the Marshal was the more obvious partner for Bel Juz, since they were romantically entangled, so Blanx was swapped out. At the time, I worked under a one character/one commission policy, so when the Marshal's piece went uncompleted for over a year before it was finally canceled, that meant he was out of the reference pile for Comicpalooza 2011, as well. I decided to prioritize the Marshal in 2012, so he was selected as the second and final piece from Jerry Rascoe, following B’enn B’urnzz. *Competition admittedly includes Luke Cage, Ghost Rider, Alec Holland, Jonah Hex, Kamandi, Christopher Chance, and Shang-Chi. Further confession involves my often wearing a brand new Power Man t-shirt but not owning a Bel Juz one since it never ever ever existed anywhere ever. Great artwork, and I wonder who from J'Onn's past continuities will make it into the new 52.